Curried leeks is an easy to make main course or side dish with only a handful of ingredients. Plus it's vegan and FREE of the nasties (gluten, wheat, dairy, soy). 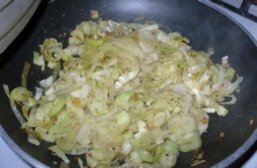 Chop the white bottoms off the leeks in thin slices. You can cut the rings in half, depending on what shape you like then in. Melt a smidge of coconut oil or butter in the pan and bring to medium high heat. Add the sea salt, pepper, and curry powder to taste - depending on how spicy you like it. Add the splash of milk/cream after they've begun to brown but before they are too soft. Brown the leeks in the pan until they wilt enough to be soft but not mushy. Takes about 10 minutes beginning to end. That's it! Pretty simple stuff. My favorite kind of meal prep - the simpler the better. We've had these as side dishes at holidays (was turned onto this by my sister-in-law, thanks Jul) and also as a main course for myself on a night with leftovers. Experiment to find out if you like them with other spices, more or less milk/cream, or with additional veggies or chunks of heartier food.